Japan annually organizes a special Bikini Day rally on March 1, the anniversary of the U.S. hydrogen bomb testing at Bikini atoll in the South Pacific Ocean in 1954. The nuclear testing of H-bomb on March 1, 1954 mostly affected the population of the Marshall Islands, but the fallout spread around the world. The Japanese fishermen became accidental victims of the testing. The H-bomb testing under the code name Castle Bravo was the biggest explosion made by the USA in the Marshall Islands. 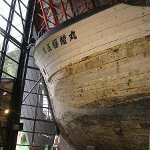 In three weeks after explosion it emerged, that a Japanese fishing boat Fukuryū Maru (the Lucky Dragon) was within 129 km (80 miles) of the test zone at that time. Its crew of 23 men was severely affected by the explosion and they suffered radiation sickness. The boat's chief radioman Aikichi Kuboyama regardless the treatment died seven month later of liver cirrhosis. The USA tried to cover up the incident with the Lucky Dragon, but subsequently it recognized its responsibility in death of Kuboyama. The Lucky Dragon ship was deemed safe for public and now its on display in Tokyo. This ship reminds everyone about that accident and the supporters of nuclear disarmament annually observe Bikini Day as a national day of struggle for peace.